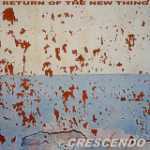 Far from being a subversive play on words verging on paradox, Return of the New Thing is a reminder that tough, uncompromising music was not invented yesterday, but has a history spanning over 40 years. One should appreciate the honesty and sense of humour shown by those behind the name - Fuchs, Guionnet, Perraud and (its author) Warburton - who, in this somewhat subversive manner, pay homage to tradition. On the other hand, there arise a number of doubts : can music burdened with so much tradition, as played by ROTNT, be fresh and honest ? Have the ideas of Ornette Coleman, Cecil Taylor, Albert Ayler and many others not become outdated or passé ? Does it make sense to refer to them ? Upon listening to Crescendo these doubts are gradually dispelled. The quartet plays music that can still be appreciated. Music that can simultaneously irritate and fascinate, exhaust and thrill, amaze but also confuse ; music that affects both intellect and emotions. Particularly noteworthy is the freedom and precision - seemingly opposing qualities - with which the members of ROTNT develop their parts. One may feel surprise that free jazz (with which the term "new thing" was synonymous) can be so disciplined and exceptionally lucid, so precisely executed. Both as soloists and accompanists the musicians maintain an exceptionally tight grip on the clarity of their expression, and in the process of saturating it with detail they fully control the dynamics and timbre of their sound, whilst never forgetting the form and structure of the recording as a whole. The album contains only two fairly lengthy tracks, which can presumably be regarded a the product of so called "structured improvisation" - i.e. free expression based on certain elements agreed in advance. If I am mistaken in this - I am not familiar with the background of the recording - and the material is improvised in its entirety, the musicians deserve even greater praise. In the quartet’s performance one can hear not only that its members are familiar with the history of jazz, but also that they are capable of transforming and personalising this history. It is presumably significant that Crescendo is jazz played by musicians who do not play jazz on a day-to-day basis (Jean-Louis Guionnet divides his time between electro-acoustic, improvised and organ music, François Fuchs customarily concerns himself with improvisation, while Dan Warburton and Edward Perraud possess a "serious" musical education and have quite thoroughly explored the world of non-conventional sounds, touching on rock, classical and various types of improvised music). Hence, their language becomes a product of the "free” idiom, traceable directly to the classics (e.g. Coleman, Shepp, Ayler and Mengelberg), as well as personal experiences connected with other areas of musical practice. Obviously, in line with its name, the music of ROTNT is dominated by the former, but tasty interjections lend it a certain amount of peculiar charm.